Median barriers and rumble strips are being considered for segments of Oregon 34 in Linn County. Careless drivers and their potential victims will likely get some help in avoiding crashes on the notorious Highway 34 next year, especially between Corvallis and I-5. The 2015 legislatture authorized $35 million for safety improvements on Oregon 34 and five other highways around the state. And on Aug. 21 in La Grande, the Oregon Transportation Commission will follow up by including the projects in the 2015-2018 Statewide Transportation Improvement Program or STIP. ♦ Place center median barriers and centerline rumble strips wherever feasible. ♦ Prioritize installing cable median barrier between Oakville Road and OR 99E interchange with centerline rumble strips on either side of the barrier, where feasible. ♦ Prioritize concrete barrier between Looney Lane and Olsen Road if cable barrier is not feasible. ♦ Place barrier between Seven Mile Lane and Goltra Road. ♦ Coordinate with (Linn) county’s plan to install a signal at 7 Mile Lane. ♦ Make intersection signing and striping improvements at Colorado Lake Road. ♦ Install a traffic separator at Columbus Road and make Columbus a right-in and right-out-only to addresses crashes there. ♦ Coordinate with an existing project to place centerline rumble strips between Peoria Road to Denny School Road. And they recently dropped the “Safety Corridor” designation because things were so much better? It would be interesting to know whether or not accidents have increased since the “Safety Corridor” designation was lifted as well as whether or not there has been a change in the number of citations issued. We drive portions of the stretch of 34 from 99E to Riverside quite often and rarely see any patrols. What is a “Safety Corridor” anyway? One assumes you are supposed to drive more cautiously, or perhaps alertly, or something; but I’ve never seen what. Of course, back in the day we learned to drive defensively. Perhaps we are supposed to be more defensive? The point being, I don’t see how it could help when virtually no-one knew what it meant anyway. I suspect it helped about as much as the highly persuasive (sarc) signs telling us not to drink and drive – as if any drunken driver was going to pay any attention. Ah well, our betters in government know best for us. First, Rumble strips are very effective at regaining the attention of distracted drivers, which I suspect are a primary cause of most of the accidents on Hwy 34. They are relatively inexpensive, far less so than the cable and concrete (jersey) barriers. Second, restore the safety corridor designation. The increased fines along with STRONG ENFORCEMENT, should wake up the daily users of this highway to exercise more caution. Much of the reason people drive the way they do is because they see there is no enforcement, and no consequences for speeding and inattention. Third, place a high priority on law enforcement agencies to patrol this highway. I haven’t seen a state police, or sheriff’s deputy on Highway 34 (other than in response to an accident or traffic control for an OSU football game) since I don’t know when. A long time. Years. I understand the funding issues but I’m on I-5 between Salem and Hwy 34 several times a week and watch both directions of travel carefully, and I don’t see law enforcement there either. Where are they? What happened to law enforcement? In the 70’s when in college in Ashland, I saw 2-3 state cops every trip, each way! I made bi-weekly trips to and from Ashland to Albany. The cops were everywhere, all along the route, They all had radar and set up effective speed traps. That’s not done anymore. Fourth. Barriers, jersey type concrete and cable are good, but no panacea. Additionally, they aren’t cheap and can’t be used in many stretches where private driveways are numerous. 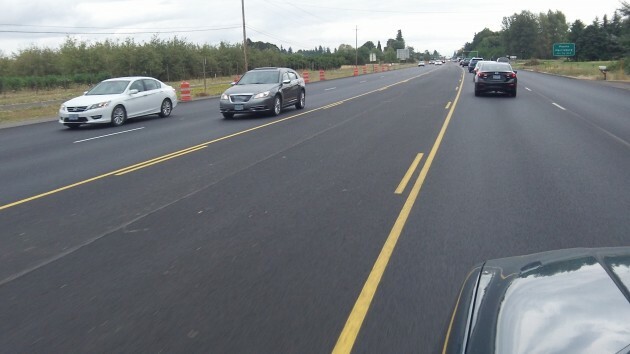 IF virtually every time a driver saw just ONE law enforcement officer monitoring traffic and/or writing citations every time they traveled between Corvallis and Lebanon, things would change fast. No warnings, double fines (safety corridor) and a date with a judge. Word travels fast. Without enforcement of speed and distraction laws, not much will change. On my first point, I meant to write “far more so than the cable and concrete (jersey) barriers.” meaning they cost far less to install. I’ve been saying that for years, put some patrollers in the area, start ticketing again, hit people where it hurts (their pockets) & they’ll automatically start paying attention & slow down! Sounds like the cheapest option to me. I drive hwy 34 daily & in 2+years other than accident scenes NEVER see an officer! Washington State Highway Patrol used to have a “Flying Squad”, which I was told, was made up of single troopers (about 12 plus a Sgt) who moved about the state saturating a given area for varying lengths of time, writing citations for every violation they observed, then moving on. They might be on I-5 near Centralia for a day or two then move to Wenatchee then back to Bellingham. It has been some time since we have been that far north so don’t know if it is still in use; however, it was sure effective when it was. I have seen OSP troopers on I-205 near Oregon City do a thing with one radar unit and 2-3 “chaser” cars who would do the pullovers and write the citations. VERY effective. That was maybe 10-15 yrs ago though. Do they plan on addressing the requirement for certain trucks to stop at the railroad tracks near Oakville Rd? I recall a couple serious crashes when vehicles driving 50+ MPH suddenly realize a unanticipated big truck has stopped in front of them.